The all-new Seat Arona crossover has been unveiled, and it will arrive in Ireland’s fastest growing segment later this month. Prices for the entry level S model of the Arona crossover range start at €17,995. The new Arona is the brand’s third new model release in 2017, after the upgraded Leon and the all-new Ibiza. In addition, the Ateca SUV and the upcoming large seven-seater size SUV that will be released before the year-end. The all-new Arona sits within the SUV range as the younger brother to the Ateca comes with a good level of driving assistance and infotainment systems. Like the Leon, Ateca and Ibiza, the all-new Arona offers S, SE, FR and XCELLENCE trims. 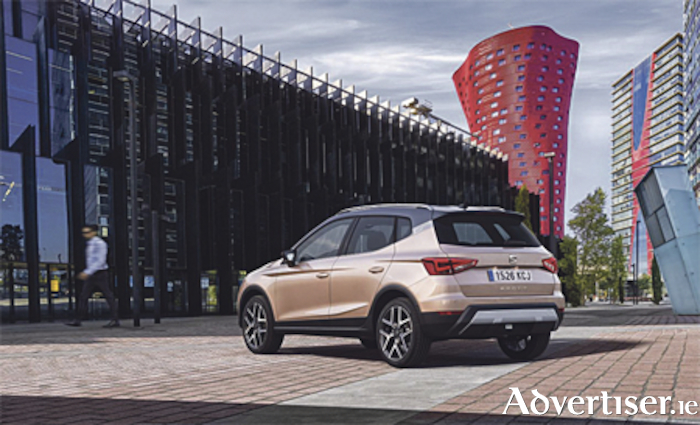 Seat says that at the front of the car, the triangular headlights with their attractive colour and luminance make the Arona instantly recognisable. All of the engines available in the all-new Arona range have direct injection, a turbocharger, and feature an automatic stop & start system. There are three different petrol engines to choose from, all with an aluminium block. The first is the 3-cylinder, 95 PS 1.0 TSI, which is linked to a five-speed manual gearbox. Also available is this same engine but in a 115 PS version, which comes with a six-speed manual gearbox or the dual-clutch seven-speed DSG transmission. The third is the new four-cylinder, 150 PS TSI with active cylinder disconnection technology, which is exclusive to the FR trim and is connected to a six-speed manual gearbox. As for diesel options, the efficient and reliable 1.6 TDI will be available with 95 and 115PS. The 95PS version can be paired with a five-speed manual transmission or the seven-speed DSG, and the 115PS with a six-speed gearbox.